Oil’s bulls are getting bolder. 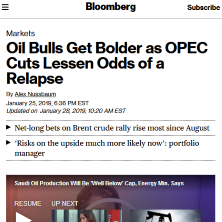 With production cuts orchestrated by OPEC taking hold and U.S. shale drillers promising to curb spending, hedge funds boosted wagers on increasing Brent crude prices by 17 percent in the week ended Jan. 22. That was the largest increase since August. Meanwhile, short-selling bets have plunged by 36 percent this month, the biggest three-week drop in about a year. Crude prices have recovered a third of 2018’s late-year losses in a rally that’s pushed the global benchmark up more than 20 percent since Christmas Eve. In the past few days, turmoil in Venezuela, holder of the world’s biggest oil reserves, added some momentum to the rebound.